Pattern is written and includes a chart showing the thumb increases. 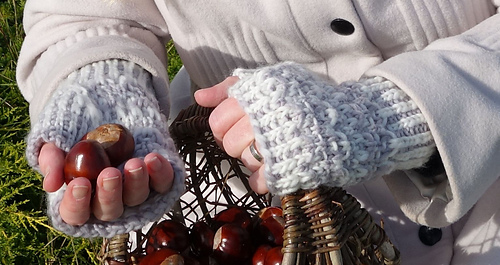 A hat and a mittens pattern is available too - if you buy one pattern, you will get get a discount for the others, and you don’t need to put them in your basket at the same time, past purchase will count. Difficulty: Medium to advanced. Two colour Italian cast on is used, and the edge of the glove is worked in two colour double knitting. However, after the (in fact quite simple) cast on is done, each round is worked with one yarn at a time only, and so the double knitting is just knit or purl with slipped stitches between. It takes some practice to get the cast on and the corrugated ribbing right. Yarn: Zitron Luv & Lee, 100 % superwash merino, 109 yards or 100 m/50 g, two contrasting colours, 50g in each colour. Colour 300 (white) and 301 (grey) was used here. 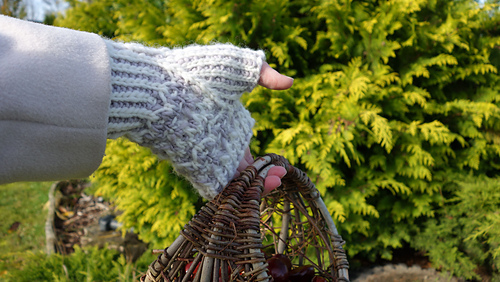 Fingerless gloves as shown in size M used in all 40 g of yarn. Sizes and fit: Adult woman sizes S (M, L), glove measures 6 ¾ (7 ½, 8 ¼) inches or 17 (19, 21) cm hand circumference, intended to be worn with some negative ease, and 6 (6 ¾, 7 ½) inches or 15 (17, 19) cm wrist circumference. The pattern is very stretchy.